As organizations continue to virtualize their infrastructures to gain higher levels of operational efficiency, VM sprawl and resource utilization are two key factors that can quickly create havoc for IT admins. In resource-siloed infrastructures, where multiple administrators are in charge of different pieces of the infrastructure, complexity continues to grow as mission-critical data sets and organizations grow. This is especially true in dynamic, mission-critical environments, where one wrong move or lack thereof could significantly impact an application, the end-user experience, or worst case, company revenue. 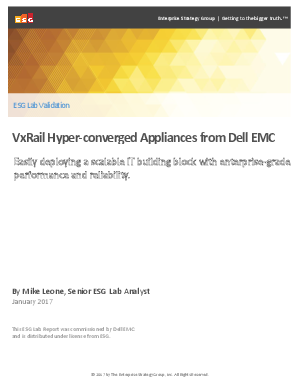 Read this whitepaper to learn how Dell EMC hyper-converged infrastructure is paving the path to IT transformation.